The United States’ power consumption will continue to rise in the foreseeable future. The increasing demand will require extensive upgrades on the nation’s power grid infrastructure and a change of energy distribution. For a stable transmission and distribution, the power grid needs a real-time match between electricity supply and consumption. Constantly fluctuating loads and generators make this generation-consumption-balance difficult to maintain. A sophisticated dispatch management of the electricity power production has to support this balance at every moment. It takes the uneven daily power demand pattern into account (Figure 1), and also balances out the unforeseeable variations in supply and demand. Especially the rapidly growing power generation from distributed, fluctuating renewable energy sources like solar and wind make the dispatch management increasingly challenging. Figure 1: Daily electrical demand profile of an average US household. The generation market provides the electric power demand (Figure 1). The constantly generated baseload is produced from the most reasonable resources. Therefore, it is the lowest-cost electric power supplied into the grid. Peaking power plants generally run only at high demand. The time required to switch from an idle mode up to full power generation is most critical. Compared to baseload power plants, the added flexibility of peak load power plants lead to significantly higher production cost. The capacity market provides on-call available power generation resources for two applications. The contingency reserves (spinning, supplemental, and replacement reserve) hold available power generation capacity for an immediate response to an unexpected power demand (e.g. after equipment failures in power plants). Regulation capacity is used to keep the frequency and voltage in the power grid stable. To support the grid stability and keep power supply and demand in balance, there are limits to what can be achieved on the supply side. The dispatch management of power plants is based on generation cost and operational constraints. Baseload units are not flexible and it takes a long time to adjust the energy output. Highly flexible peak power units may be very expensive to operate. Also, for a given control area the power demand may be greater than its power generation capacity. Typically electric power has to be purchased from the outside to avoid grid instability. On the other hand, during low demand times power plants are working in idle mode, and energy that is not used is going to waste. Peak shaving is one possibility to improve the utilization of power grid assets and avoid investment in new energy production. Distributed energy storage (DES) can be installed at the end of the feeder line. Energy that is not used during low demand times can be stored close to the power consumers and released during high demand peaks (Figure 2). In a similar fashion, storage units installed closely to renewable power generation could shift the power release to times when a large amount of energy is needed. Figure 2: Peak shaving of electrical loads by storing energy at low demand time. The installation of DES along all levels of the feeder line will improve the stability and reliability of the electric power transmission and distribution. Also, energy storage will enhance grid resilience related to weather caused outages or disruptions and will minimize the risk of cascading power outages. Batteries are the technical solution for the needed distributed energy storage. They are deployable, scalable, easy to install and to operate. Future battery production capacities will avoid extensive storage installation lead times. Standardization will allow a fast permitting process. Also, the minimal environmental impact of a battery installation will avoid public acceptance challenges known from other technologies. Na4B’s batteries will provide the needed energy storage for the shift in the power grid operation. In today’s electrical grid, the power generation is centralized with a direct power distribution to commercial and private customers (macrogrid). The future grid architecture will develop towards a network of numerous smaller power plants and distributed microgrids. They are established by interconnecting electricity sources, loads, energy management, and energy storage. Various sources of distributed generation, especially renewables, can be effectively integrated into microgrids. Micogrids are able to operate autonomously in island mode. This allows them to be disconnected from the surrounding power grid (e.g., during power outages). The capability to sustain power generation and supply in an emergency is especially important for military bases. In addition, in case of a macrogrid power outage, microgrids can provide electricity to the surrounding system. Na4B’s energy storage can provide capacity for peak shaving, frequency stability, and voltage support within microgrids. Also, DES along the feeder line will enable microgrid-zoning of the future grid architecture. Na4B’s batteries will be the required distributed energy storage in the future mircogrid based grid architecture. The power frequency in the grid has to be maintained within a tight tolerance close to its nominal value, which is 60 Hz in the U.S. Also, on all levels of the power grid the actual voltage has to be as close as possible to the norm. Many dynamic effects can influence frequency and voltage: e.g., moment-to-moment fluctuations in customer loads, unintended fluctuations in generation, or changing resistances in transmission lines according to the surrounding temperature. Continuous adjustments of local generators or loads are required to maintain a stable frequency and voltage. Regulation requires a frequent shift between energy supply and energy consumption. Charging and discharging of stationary batteries can perform that immediate switch. According to the Energy Storage Association, frequency regulation has been identified as one of the best values for increasing grid stability. Na4B’s energy storage provides the regulation capacity in the event of a system contingency for frequency response. Electricity generation from renewables became competitive in many markets, which is visible in the installation growth rate over the last years. Renewable Portfolio Standards (RPS), mandatory in many states, is one driver of that. The widespread distribution of fluctuating renewable energy sources make the integration challenging. Energy storage installed at the production side may smooth out the variable generation. 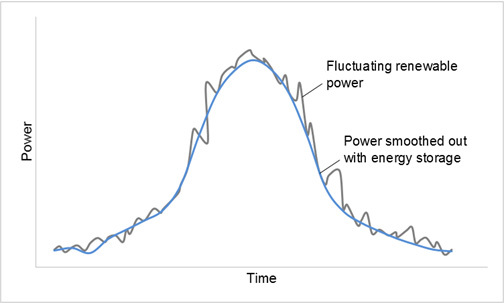 Figure 3: Smoothing out fluctuating renewable energy generation output. With increasing incorporation of solar energy, utilities are facing serious changes to their traditional load-demand-balance. In Figure 4, the graph shows the total utility load after wind and solar generation serves some of the demand (California ISO, 2014). Figure 4: Total load a utility serves with increasing incorporation of solar energy. 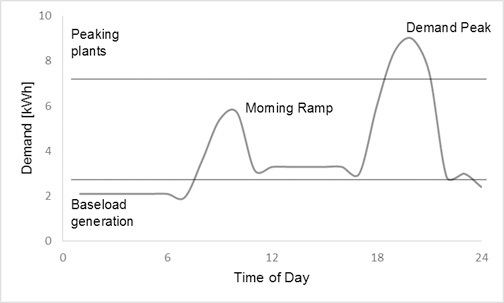 The graph represents an average day, rather than a peak demand day. 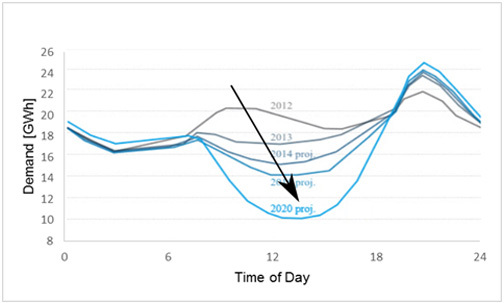 Utilities can use energy storage for load leveling to avoid the risk of over-generation in the afternoon and an increased need for ramping as solar drops off in the late afternoon. By storing solar energy during periods of light load and delivering it at high demand, the load on less economical peaking plants can be reduced. The combination of energy storage and renewables are a natural fit. Na4B’s batteries will provide the needed energy storage for a further integration of renewable energy sources into the power grid.